THIS IS A COPY OF MY REVIEW WHICH WAS FIRST POSTED IN MY COLUMN, “EXTREME CULTURE” ON FLORIDA TODAY’S WEBSITE. VISIT WWW.FLORIDATODAY.COM/EXTREMECULTURE FOR THE REVIEW AND OTHER UPDATES ON AREA THEATER. Given today’s world, in which the god of hatred has replaced simple commandments to love one another, and where people feel justified to dismiss an entire segment of society, the story about prejudice in “South Pacific” deserves to be re-examined. The 1949 Rodgers and Hammerstein musical is based on James Michener’s “Tales of the South Pacific.” Set on a Navy base in Solomon Islands during World War II, “South Pacific” concerns love torn apart by narrow mindedness. In it, Navy nurse Ensign Nellie Forbush falls for Emile de Becque, a Frenchman who has moved to the remote island and become a wealthy plantation owner. The two are the epitome of romantic couple. Here, directed by Allen D. Cornell, the couple tease, flirt, embrace, cuddle and, in all, reveal the heady rapture of love. On the heels of an especially perfect evening, where Nellie allows herself to dream about life with Emile, she discovers that he has two bi-racial children. Nellie, who hails from 1940s Little Rock, Arkansas, breaks it off suddenly and leaves. Another couple, Lt. Joseph Cable and Liat, the innocent daughter of colorful island huckster Bloody Mary, also fall in love and separate for the same reasons. A Princeton man, Cable cannot imagine bringing a Tonkinese bride back to Philadelphia. All four lovers agonize over the decisions. And, so does the audience thanks to Cornell’s careful attention to storyline and the cast’s rounded portrayals. Indeed. One has to feel the grandeur of love to understand the void created when prejudice destroys it. Setting this up are resonating performances, especially those by opera star David Pittsinger as Emile, Heather Botts as Nellie, Ross Lekites as Lt. Cable and George Merrick as Luther Billis. You might as well forget the rest of the world when Pittsinger sings. His deep voice easily fills the entire theater and sets you sailing in dreamy rapture to songs such as “Some Enchanted Evening” and “This Nearly Was Mine.” But more than a voice to make you swoon, Pittsinger carves a portrayal with tenderness, romance and a soupçon of dashing matinee idol. Botts’ delicate, feminine touch to Nellie enhances her rejection of Emile. You realize this bias runs very deep in a woman so in love. Botts is especially winning in “A Wonderful Guy” and “I’m Gonna Wash That Man Right Outa My Hair,” during which she even sells moments rather silly choreography. Lekites shows he’s got more than good looks in “You’ve Got to Be Taught,” the song in which Cable rails against being brought up to hate. And Merrick is utterly loveable as Billis, the big-hearted guy who’s always on the lookout to make a buck, even in war. The ensemble is a fun group, changing scenery, changing costumes, advancing the show and always keeping up with its pace. Standouts are Jodi Kimura as the darkly funny Bloody Mary, and Joseph Deliger as Capt. George Brackett. As the scenic designer, Cornell advances the story’s theme visually by using wooden and bamboo barriers for a false proscenium. And, his reprise of “Bali Ha’I” captivates with his simple use of a provocative Polynesian dance performed on the foggy shores of the mystical island. Adding to the exquisite visuals are Kurt Alger’s costume and wig design, Yael Lubetzky’s lighting design and DJ Salisbury’s choreography. Music director Ken Clifton leads a fine 10-piece pit orchestra and sound designer Craig Beyrooti works his magic by filling the house with rich sound. 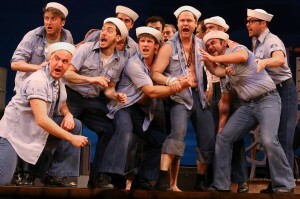 You’ve surely seen “South Pacific” by now. But, like I was, you might be surprised how much more you understand in the story thanks to Riverside Theatre’s eloquent production. Indeed, at the show I attended, one could hear audience members gasp at certain plot points. Moreover, Nellie and Emile will win you over and set you crying for the sheer romance of it all. SIDE O’ GRITS: “South Pacific” runs through March 9 at Riverside Theatre, 3250 Riverside Drive, Vero Beach, Florida. Tickets are $45 to $70. Curtain is 7:30 p.m. Tuesdays, Wednesdays and Thursdays; 8 p.m. Fridays and Saturdays; and 2 p.m. Wednesdays, Thursdays, Saturdays and Sundays. Call 772-231-6990 or visit www.riversidetheatre.com.